In our eyes, this wedding was perfect. Amazing guests, an incredibly supportive family and a couple who really love each other – it’s a recipe for magic. When you have a wedding such as Tanya and Nigel’s it truly doesn’t seem like work at all. Simon, Linda and myself were made to feel welcome right from the start; we had a blast throughout the whole day. 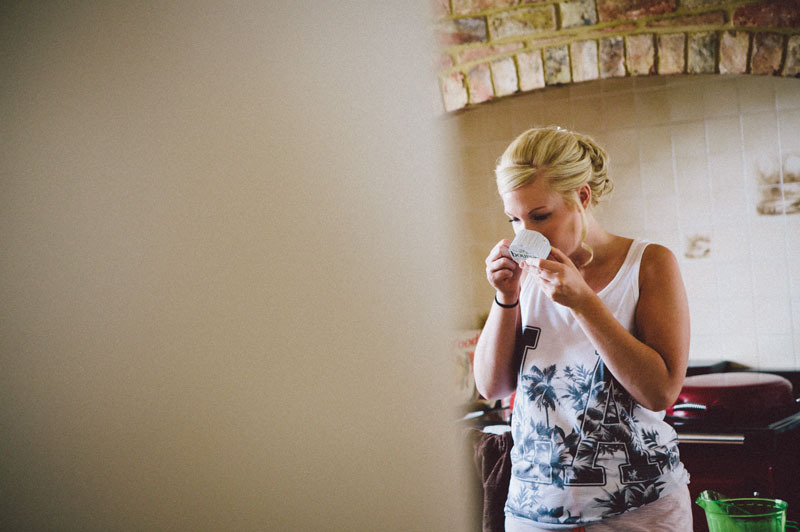 Tanya and Nigel had put a lot of thought into the details for this day, and believe me when I say they were fantastic, but the amazing aspect was the deep connection between everyone there. To be a part of that is a real joy…..thanks to everyone who made it such a memorable experience for us. We won’t forget it. So, on to the day….. Arriving at Tanya’s home, we were greeted with croissants and pastries…..oh, it was a lovely start! Everything was extremely calm and relaxed as the girls started getting ready. Tasha loves the smell of cheese! We don’t often have the opportunity to photograph the guys preps, it was great that Tanya and Nigel asked me to bring in the talented, Simon Holmes. Back at the girls’ pad, Tanya was looking stunning. We were asked to get a couple of reasonable shots of Oscar, hopefully these will suffice. Nigel’s party had made their way to the castle ready for the ceremony. Simon managed to capture this ‘cheeky’ shot. Nigel and Simon were either looking at the castle rafters or seeking some divine affirmation. An emotional and heart-felt ceremony at Tattershall Castle. On to The Dower House for more celebrations. I found a new apprentice….meet Lauren. If you want to get everyone on to the dance floor having a good time, you can’t beat a céilidh. Even Simon and myself ended up dancing. To top off what was an amazing day, Nigel’s son arrived to join the celebrations. This next shot is what happens when you direct your camera high in the sky to capture a firework display, and it’s raining! Thanks again to Tanya and Nigel for allowing us to be a part of their fantastic celebrations.